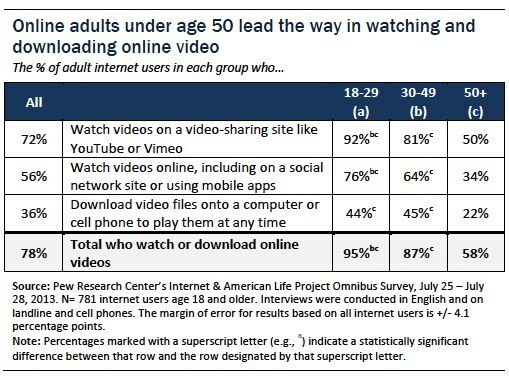 While almost all online adults age 18-29 (95%) and most of those age 30-49 (87%) watch and/or download online videos, that figure drops to 58% among online adults age 50 and older. 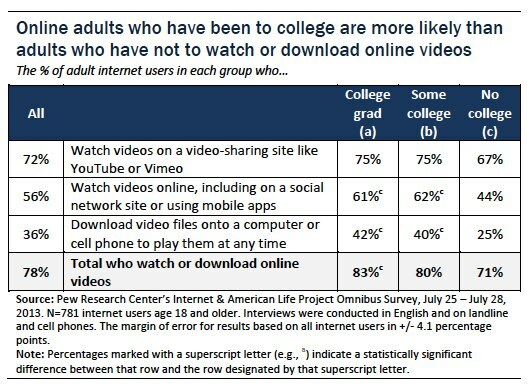 Roughly eight in 10 online adults who have graduated from college (84%) or attended college (80%) watch and/or download online videos, compared with 71% of those who have not been to college. The introduction of video-sharing site YouTube in 2005, and later other video-sharing sites like Vimeo, has been the driving force in the increasing percentage of online adults who post, watch and download videos. 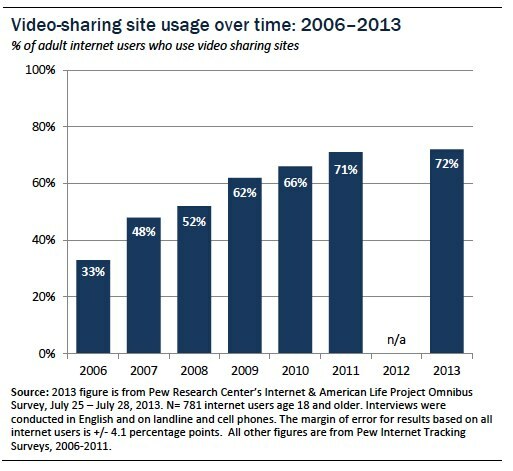 Since we first began measuring use of these sites in 2006, the percent of online adults using video-sharing sites has grown from 33% to the current figure of 72%. 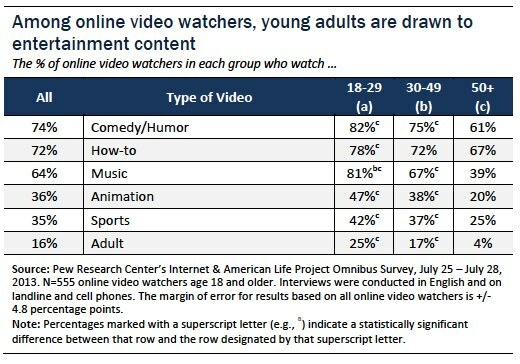 As we found in 2009, comedy and educational videos are among the most widely viewed video genres, with 58% of all online adults saying they watch comedy/humorous videos and 50% of online adults saying they watch educational videos.5 These two genres are now joined at the top of the list by how-to videos. 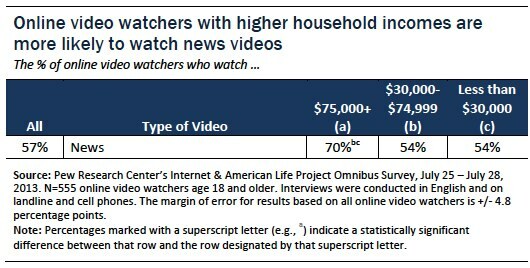 The current survey is the first time we have measured this genre, finding that 56% of online adults are watching how-to videos. Music videos showed the largest growth in viewership between 2009 and 2013, from 32% to 50% of all online adults, placing it among the most popular genres of those asked about. 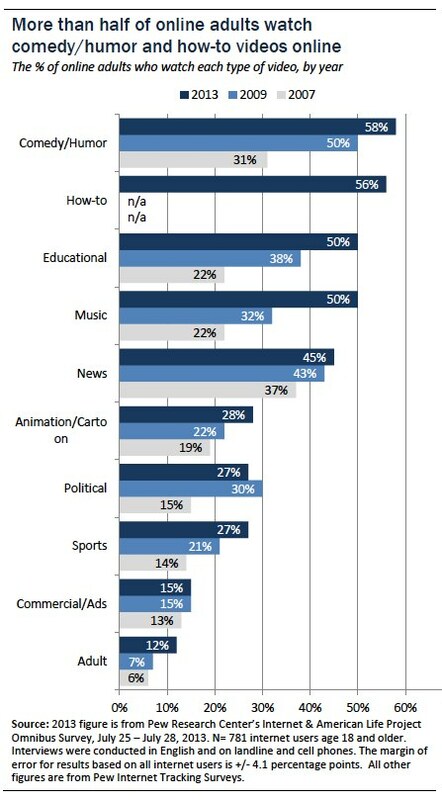 Among the video genres asked about, political videos, sports videos, and commercials/advertisements are viewed by smaller segments of adult internet users. Adult videos are also viewed by a fairly small segment of adult internet users (12%), though this may reflect a reluctance to report the behavior among some adults. Among adults who watch videos online, different genres appeal to different demographic groups. Online video consumers under age 50 are more likely than their older counterparts to watch music, comedy, how-to and animation videos, among others. 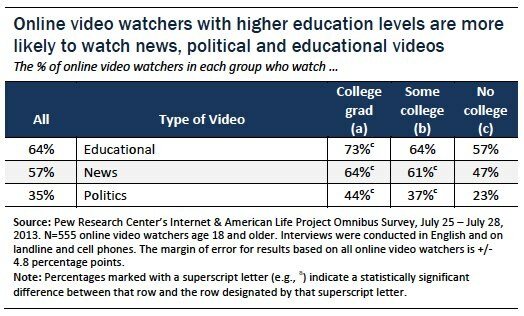 News videos appeal to video watchers with higher education and income levels. 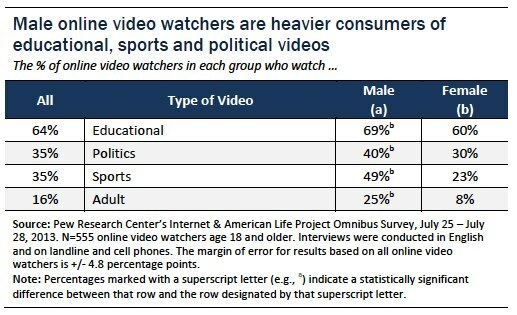 And male online video watchers are more likely than females to view sports, educational, adult and political videos. 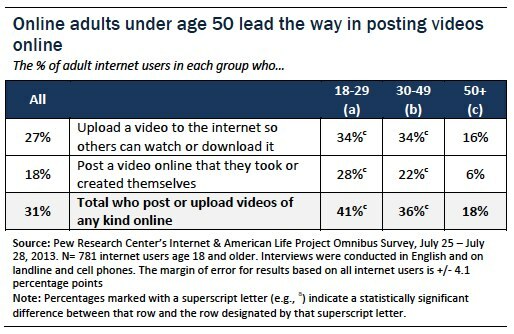 18-29 year-old internet users (41%) and 30-49 year-old internet (36%) are twice as likely as online adults age 50 and older (18%) to post or share videos online. 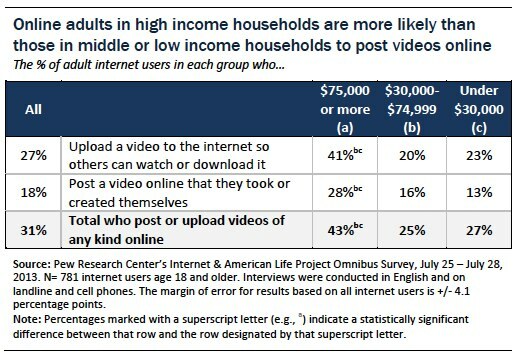 43% of online adults with household incomes of $75,000 or more post or share videos online, compared with 25% of online adults with household incomes of $30,000-$74,999 and 27% of online adults with household incomes below $30,000. Among the 18% of adult internet users who post their own videos online, the most popular topics are fairly mundane. More than half post videos of family and friends doing everyday things (58%), themselves or others doing funny things (56%), or events they attend (54%). In contrast, just 23% post videos they have intentionally staged, scripted or choreographed, and just 30% post educational or tutorial videos they have made. 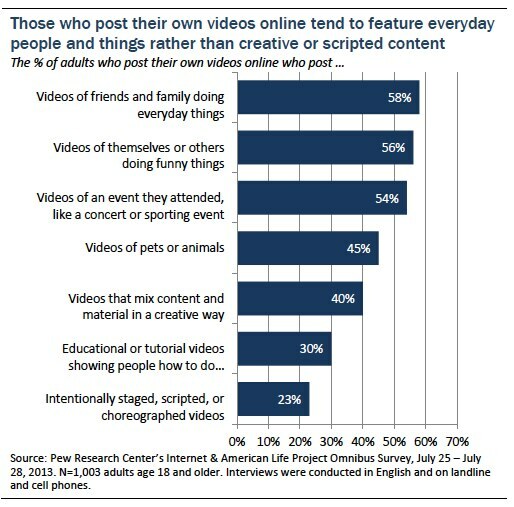 Among all adults who post and share online videos –either self-created or created by others—35% say they have posted a video online with the hope of it being widely viewed or “going viral.” That equates to 11% of all adult internet users. The desire to have a video “go viral” is particularly strong among younger adults. Among adults who post videos online, 39% of those under age 50 have posted a video hoping it will attract a large audience, compared with just 19% of video posters age 50 and older. Just 5% of adults who post videos online say they regret something they have posted. The rise in both watching and posting videos online has been fueled, in part, by the rapidly increasing popularity of online social networking sites. As of May 2013, almost three quarters (72%) of online U.S. adults were using social networking sites, up from 67% in late 2012. When Pew Internet first started measuring social networking site use in February 2005, just 8% of online adults were using these sites. 45% of all adult internet users watch videos on social networking sites. 22% of all adult internet users post videos on these sites. 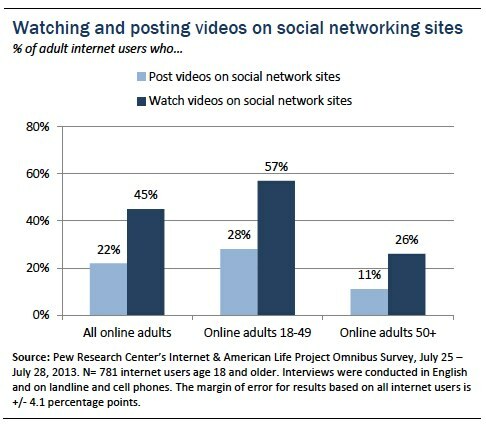 Online adults under age 50 are more likely than older internet users to both watch and post videos on social networking sites. 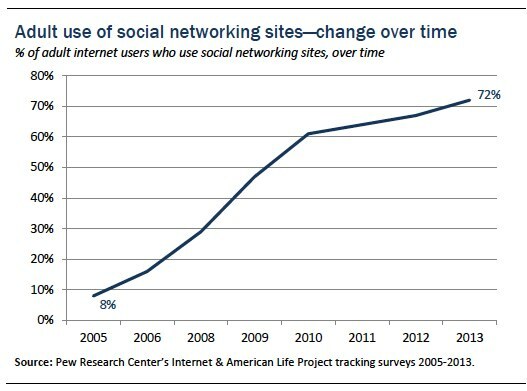 This reflects, in part, the fact that younger online adults are more likely to be social network site users overall. The growing online video culture is also, in part, a byproduct of the dramatic increase in cell phone and smartphone ownership among U.S. adults over the past decade. 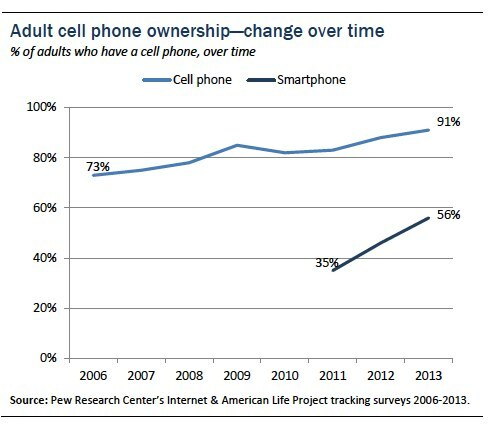 As of May 2013, 91% of U.S. adults owned a cell phone of some kind, including 56% who owned a smartphone. Cell phones and smartphones allow their users to easily watch videos on their mobile devices, as well as to record and post videos. When adult cell phone owners are asked about the different ways they use their phones, texting and accessing the internet remain the most popular activities. Yet fully 41% say they use their phones to watch video and another 40% say they use these devices to record video. 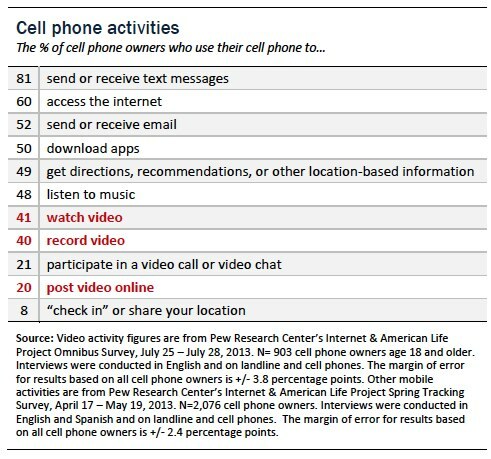 Twenty percent of adult cell phone users use their phones to post videos online. 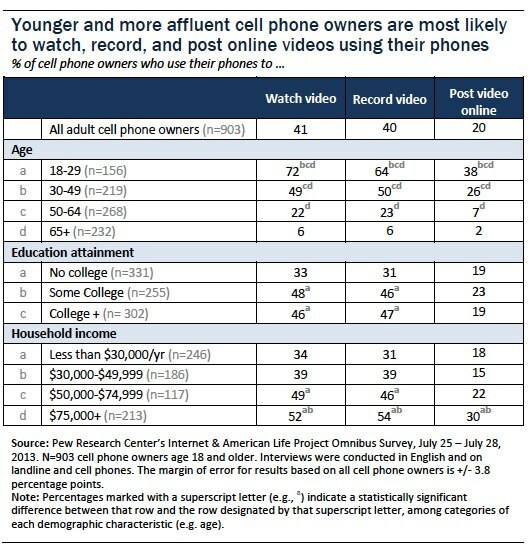 All three of these mobile activities—watching video, recording video, and posting video online – are more popular among younger cell phone owners and those in higher income households. Adult cell phone owners who have been to college are more likely than those who have not to use their phones to watch and record videos. 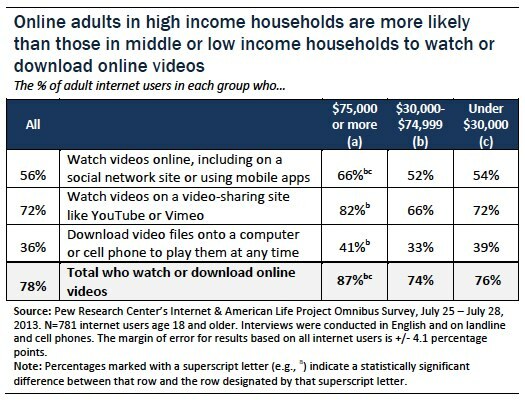 And adults in the highest incomes households ($75,000 or more) are more likely than those in lower income households (under $50,000) to watch, record, and share videos using their phones.